Click the following link for a 36-photo gallery of motocross race action from the AMA National Championship Motocross at Steel City. You can also click the following link for a 36-photo gallery from Saturday's pre-race action in the pits at Steel City, as well as timed qualifying. Don't forget, if you're a Vital MX member, you can comment on any of the photos in the galleries. Not a member? Join now! It's fast and free. 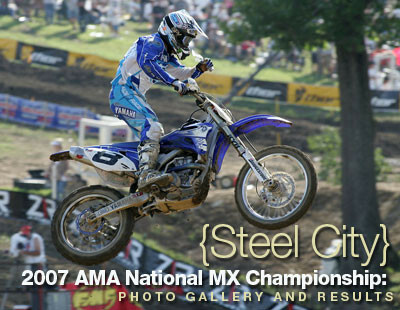 If drama-filled motos full of crashes, charges through the pack, local heroes, tight championship points chases in both classes and good, hard racing are your thing, you won't be disappointed by Steel City. Ryan Villopoto claimed another overall win in the Lites class after body surfing the first turn at the start of the first moto. He charged back to third place, while Broc Hepler took the first moto win on his home track. Ben Townley was also involved in the same crash with Ryan Villopoto, and while he made it back to sixth spot, he lost a few points to Villopoto. in the title chase. In the end, it was another podium sweep for the Monster Energy Pro Circuit Kawasaki crew, as Brett Metcalfe scored his second-straight podium. In the Motocross class, Mike Alessi took the first moto win ahead of Grant Langston, but Langston's 2-1 was good for the overall win. Kevin Windham was also in the mix in both motos, and was particularly fired up in the second moto after he and Langston tangled in the first moto, which forced K-Dub off the track. There are now four riders (Langston, Short, Ferry and Alessi within ten points of each other for the lead in the title chase, and only four motos left to settle it.